News | | Published: 13:00, Thursday January 31st, 2019. Drones. Love them or hate them they are now a firm feature of 21st Century life. The small aircraft have had bad press recently given their ability to cause chaos for air travellers. But the scenes at Gatwick and Heathrow are typical of the problems that an emerging technology can cause when used incorrectly. 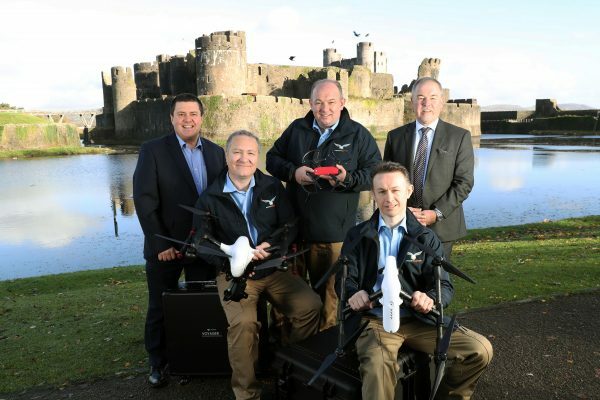 However a new Caerphilly-based company is harnessing drones to power its business. The company launched in November last year and has secured a £180,000 investment. Toby Townrow, co-founder of the firm, said: “One of our aims is improving safety. “Thirty-five people in the UK died in 2017 while working at height. As well as acting as consultants for safe drone use and how other businesses can use them, the company is also looking to develop and supply tethered drones for prolonged use. Most commercial drones can only fly for around 20 minutes before their battery runs out, but a tethered can have power fed to it – especially useful for security and crowd safety at public events. The firm, based on the Western Industrial Estate, is aiming to grow to employ around 12 to 15 staff over the next three years. It has been backed with a £90,000 investment from a syndicate of ‘angel investors’ – match-funded with another £90,000 from the Development Bank of Wales. Lead investor Andrew Diplock is the former Managing Director of UES Energy, a company formed in Caerphilly which he grew to a successful exit in late 2015. Mr Diplock, a former chair of Caerphilly Business Forum, said: “What I look for in any business are the right individuals with the right experience, a great business model and a growth ambition for an ultimate exit. Mr Diplock is joined by experienced angel investors Gruff Dodd, Phil Buck and Ashley Cooper. Drone Evolution’s Managing Director Clayton Earney, who established the firm with John Young and Mr Townrow, said: “This is a show of faith from investors that this is a business that’s worth investing in.